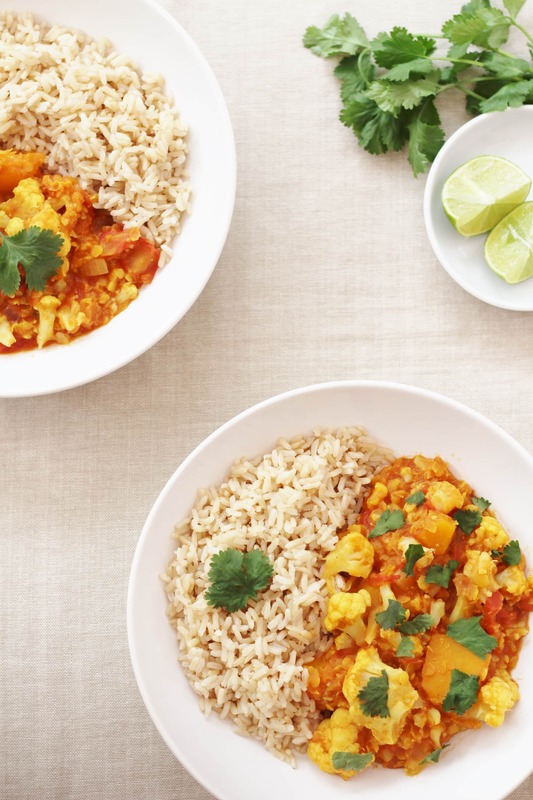 A deliciously simple and delightfully tasty vegetarian curry, this Butternut Squash, Cauliflower and Red Lentil Dhal is a great midweek meal, for when time is tight – it’s also a fab recipe for using up any leftover veg you might have lurking in the back of your fridge! 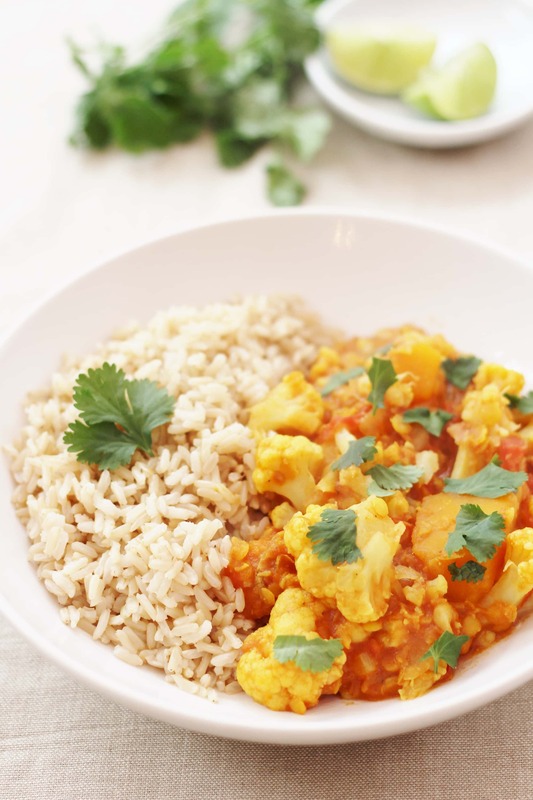 This Butternut Squash, Cauliflower and Red Lentil Dhal is a tasty, healthy and, above all, EASY curry packed with delicious vegetables and lentils – lentils are a truly amazing and very nutritious food – a great source of vegetarian protein as well as being low in fat, high in fibre, and full of vitamins and minerals, such as potassium, iron and magnesium. They are also fab at thickening sauces and bulking out a meal to make it go further (handy if pennies are tight!). 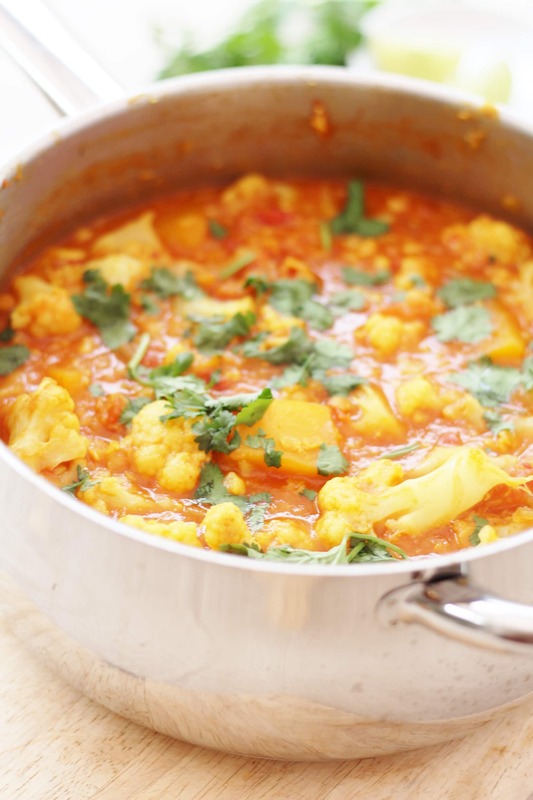 This dhal is wonderfully adaptable too. I originally invented it as I had half a butternut squash (why is it I always seem to have half a squash?!) and a slightly sad looking cauliflower lurking in the back of my fridge, and this combination of squash, cauliflower and red lentils does work really, really well, but this curry would be a fab way to use up any leftover veg you happen to have – broccoli, peppers, mushrooms, sweet potatoes, carrots, courgette and aubergine would all be great in this. 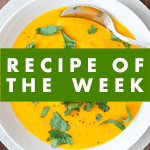 And if you want to make it meaty you could add in some leftover cooked chicken, turkey, lamb or beef – I think this would taste particularly good with some leftover roast chicken. Just throw the meat in right at the end and then make sure the meat is piping hot all the way through before you serve up. If you are catering for a mixture of vegetarians and meat eaters, simply serve the vegetarians first before adding the meat. 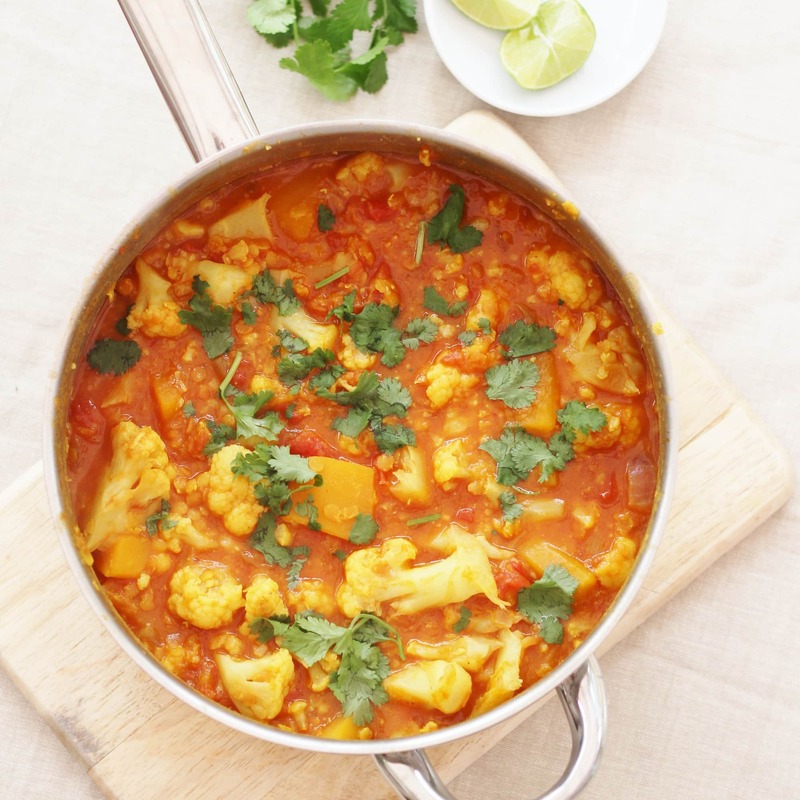 Using leftover veggies and meat together with a few store cupboard basics means this curry is really economical – and could be stretched even further with the addition of a tin of chickpeas, if you have more mouths to feed! 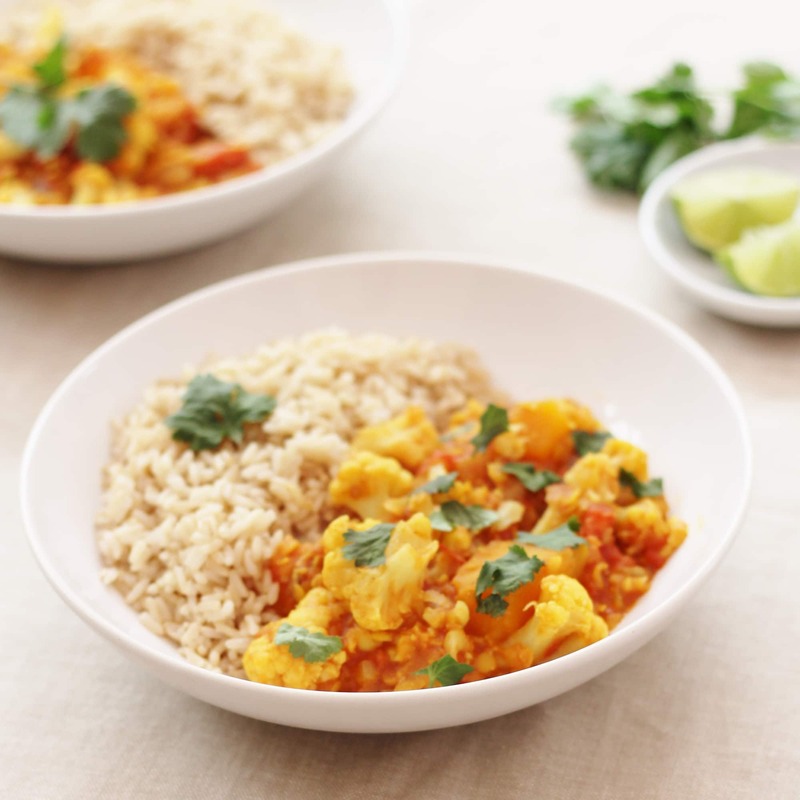 This is also a fab meal to have for lunch the next day – either reheat in the microwave or on the hob. The flavours develop overnight and consequently I think it tastes even better the next day! 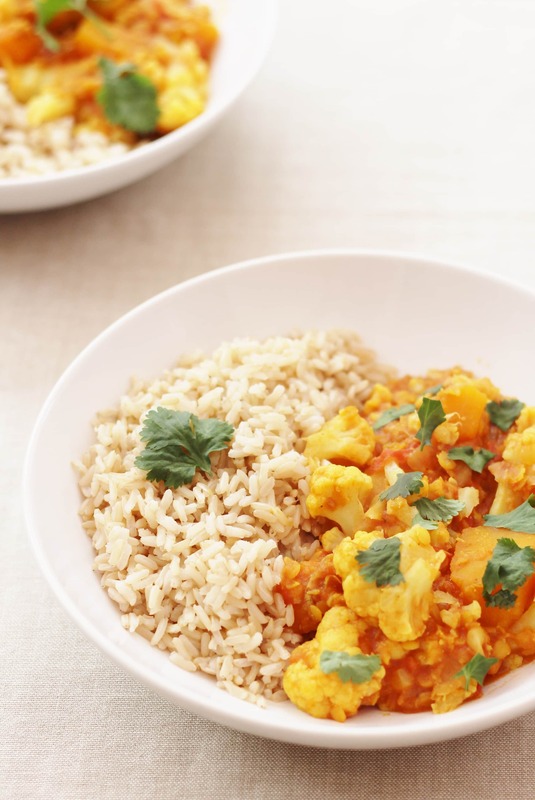 To make this curry extra healthy, I have served it with brown rice, but it would also go well with white basmati rice, naan breads or chapattis and all your favourite pickles and chutneys! I would choose a Chilean or New Zealand Sauvignon Blanc to serve with this…my husband would definitely choose beer! A light golden ale for preference, such as Old Golden Hen. Place the olive oil and sliced onion in a wide, deep saucepan and cook on a gentle heat, with the lid on for 5 minutes, stirring occasionally. Add the garlic, ginger, chilli, garam masala and turmeric, plus a splash of water to stop the pan going dry, and cook the paste for about a minute. 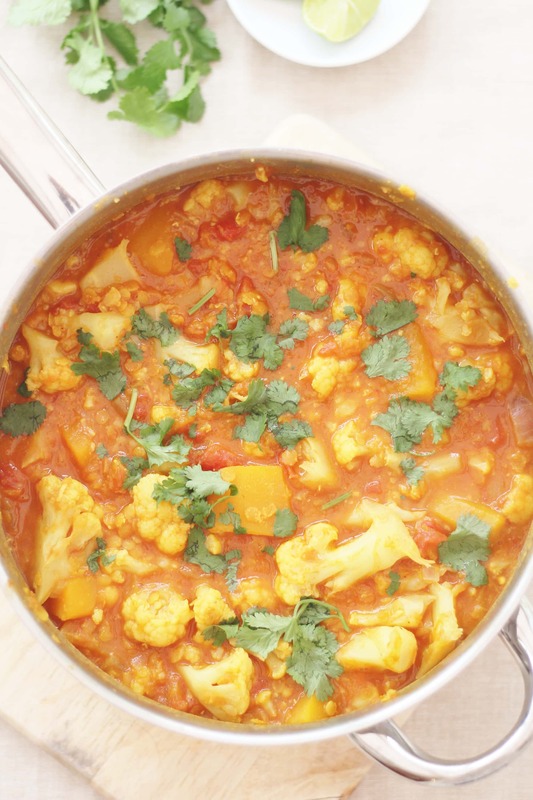 Add the chopped butternut squash and cauliflower, plus the lentils and the tin of tomatoes. Fill the tomato tin with water and add to the pan, then add a little salt and pepper. Stir everything together and bring to the boil, then turn down and cover with a lid. Cook for 15-20 minutes until the vegetables are cooked through and the sauce has thickened. Add a splash more water if the pan gets too dry. While the curry is cooking, make your rice according to packet instructions / your own preferences. When the curry is ready, add in the coriander and lime juice (if using) and serve with the rice/naan/chapattis and a glass of Sauvignon Blanc. 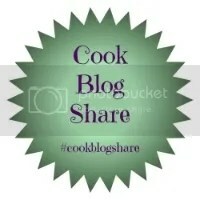 I am linking this up to Brilliant Blog Posts, Cook Blog Share, Recipe of the Week and Meat Free Mondays. This is definitely my kind of meal and such a great way of using up all the veggies that might otherwise get past their best! Sounds delicious. As look would have it I love daal and I have half a butternut squash sat in my fridge! Perfect timing or what? Definitely pinning this Eb. Absolutely love the sound (and look) of it 🙂 Although Mr E wouldn’t thank me for making it (sadly 🙁 ) given his dislike of spices (even though this is mild) I could certainly make this at my parents house. I’m sure they would absolutely love it. Dhaal is one of my favourite curries. My friend’s mum makes an amazing one – very simple with just with the lentils onions and spices (no other vegies) and is more like a soup to be honest. 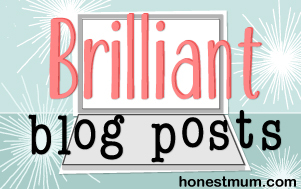 She always has a mazzive pan of it on the hob and seems to add bits and pieces to it all the time – perhaps left overs from other curries etc so it always subtly morphs and changes. 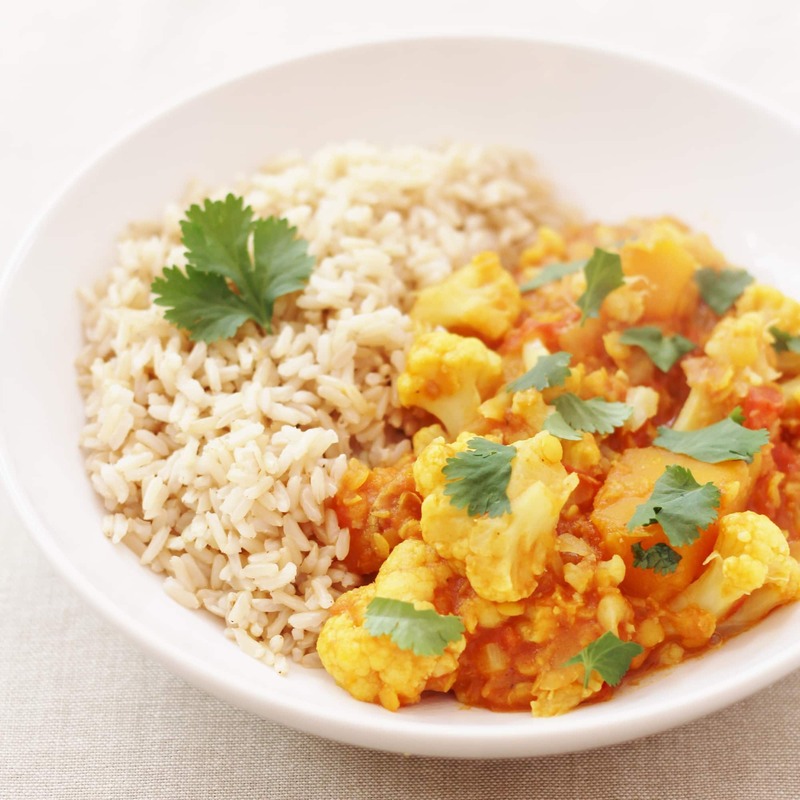 All your curries are so nice, Eb, and this one is no exception! Easy, healthy and delicious are my 3 favourite words in any recipe and this one has definitely got them all. Sharing the pants off this! LOL!